This article, written by Elizabeth Styffe, Global Director of the Orphan Care Initiative, originally appeared in Ministry Today Magazine. At the heart of orphan care at Saddleback Church is the desire to end the orphan crisis. We believe every child deserves a loving, lasting, legal, lifelong family of their own—and we believe this is doable. If every church empowered their members to care for orphans in ways that helped and didn’t hurt, the orphan crisis could be over. Unfortunately, though there are still more than 163 million orphans and vulnerable children in the world today, little has been done yet to help orphans stop being orphans. As a culture, we’ve spent years trying to put Band-Aids on the orphanage institution. But children need more than food, shelter, clothing and education. We don’t want children to just survive, but to thrive—and children thrive in family. At Saddleback, we began asking ourselves, “How can we end the orphan crisis, and is there something every church can do?” Here are what we believe are the answers to those questions. Orphans stop being orphans when they become sons and daughters. At Saddleback, we’ve been challenged to change everything about how we care for orphans and how we engage members to care. We have two goals: (1) to end the orphan crisis; and (2) to get every member on mission, caring for orphans locally and globally by helping them find a family of their own. Family is God’s remedy for orphanhood. The church doing for orphans what God has done for us is His solution. Because of this, we believe that if more Christians would do physically for orphans what God has done spiritually for us, the orphan crisis would be solved. When we were orphans, God adopted us. Scripture teaches that the reason God made the world was so He could adopt (see Eph. 1:4-6). Our triune God, who needed nothing but wanted a family of His own, allows us through the blood of His Son to share in the rich communion as His sons and daughters (see Eph. 1). When God adopted us, He made us part of His permanent family, so we would no longer be orphans. Even though we were not His bloodline, He grafted us in through adoption, giving us permanent security and a family, and meeting our need to belong. His adoption of us is a legal process that cost Him everything. It gives us an inheritance and the right to call Him Abba, or “Father” (see Gal. 4, Rom. 8). As a result, at Saddleback we are in the work of reconciling people to God through adoption (spiritual adoption), and helping children stay in their families, be reunited with their families or find a new family through adoption (physical adoption). There are 163 million children at risk in the world today but 2.4 billion people who claim the name of Jesus. This means the solution for every child is a church where all the members are caring about orphans. Churches can help orphans find a new family through adoption. They can help them remain in their current family if it is safe. Or they can help them reunite with their families if they are separated (since most children in orphanages have families in the communities but need the church to help the family become safe, healthy, and financially and emotionally ready to care). The Orphan Care Initiative at Saddleback empowers ordinary believers to help orphans and vulnerable children locally and globally, and it also focuses on helping children find families. On the local level, this could mean doing several things: volunteering to serve children recently removed from their home, helping with sessions for people thinking about adoption, giving financially to someone who is adopting, or caring for newly adopted children while their families gain support. Even if you can’t adopt (and not everyone should), you can help someone who is adopting. This has changed what Saddleback does cross-culturally. We send teams to help churches start orphan ministries that provide permanent, legal, lifelong families for children. We don’t invest in group homes or orphanages or other often harmful substitutes for families. We help local churches and governments find and equip families for adoption. The emphasis is on solving the orphan crisis through adoption. We’re not talking about Americans adopting (although the very small and declining number of adoptions last year in the U.S. is evidence that more people should). Instead, this is about helping churches all over the world legally adopt children, doing what’s best for a child and ending the orphan crisis. Open your heart to God’s heart for the orphan. Recognize your responsibility to find permanent families. Prevent children from being orphaned. Help orphans in ways that move them out of orphanhood. Affirm loving, legal and lasting families by preservation, reunification, or adoption. Never forget the local church is key. The church’s approach to orphan care has changed dramatically from what it once was. Let’s continue moving closer to God’s heart for adoption, as found in His Word. He’s given us the perfect ministry model, so let’s embrace it. By working together, churches can end the current worldwide orphan crisis. CHIFF Tweet-Up Today – Make Your Voice Heard! Children In Families First (CHIFF), a bipartisan bill that would prioritize family as a key element of U.S. foreign policy and help streamline international adoptions, is hosting a Tweet-Up today – and your voice matters! CHIFF’s goal is to get the word out and influence members of Congress who will be voting on the bill. Help raise awareness for this important bill that could help orphans around the world find family and change the face of international adoption in America by tweeting your support and sharing its importance with your followers! Please check out the CHIFF petition, sign it, and share to your friends on social media (http://childreninfamiliesfirst.org/please-sign-chiff-petition-today/). There is still a long battle ahead for this important piece of legislation, but with your help we can help children get into families much faster! Visit the CHIFF page at childreninfamiliesfirst.org to learn how you can get involved. You can also follow CHIFF on Twitter and like their Facebook page to keep up with all the updates. Ernie and Pat are two ordinary members of Saddleback who have chosen to make an extraordinary difference by caring about orphans. Adoptive and foster parents, they have seen first hand the difference that family makes in the life of a child who has been deprived of a mom and dad. Below, Ernie shares a bit of his wife’s own remarkable adoption story – a miracle dating back to World War Two in Germany. In 1947 post war Germany, a mother named Alma Mosher, a military wife lived in Germany as part of the US Occupational Forces. Alma had two biological sons, but her heart still longed for a daughter. In a German orphanage, Alma found a six month old, brown-eyed little girl whose parents had thrown her away because she wasn’t the boy-warrior they wanted. She picked up this precious baby girl, so tiny and underweight, and she knew that it was God’s plan for her to adopt her. Then the true battle started. The politics in Germany and the rights of American GI’s and their families were not yet established. Alma refused to leave the country without the baby girl in her arms. After months of negotiations, Baby Pat officially became Alma’s daughter, and the first baby adopted in post-WWII Germany by an American GI. Alma’s refusal to accept a negative answer opened the door for adoption in Germany. Forty years later, Pat lives in Lake Forest, CA and attends Saddleback Church. She is married with two boys, and like her mother, feels God’s call to help a little girl just like she was helped long ago. Accepting God’s call, Pat became a foster parent to three girls: Jessica, Kimberly, and Elizabeth. Pat felt God’s call to foster and readily accepted, but she didn’t know the difficulty it would bring her; the same difficulty her mother faced years ago. Pat advocated for her girls – to protect them and to give them a better life. All three girls had come from difficult and traumatic situations, and needed the healing love of a family. Despite the difficulties, Pat’s love for her girls only grew with her desire to battle for their care and protection. There is a story for each of these little girls that would fill a thousand novels, but the bigger story is how the love of a mom, who wouldn’t give up despite the hard circumstances, made a difference in the world more than a generation later. Jessica is now a 27 year old woman living in Boston, now reunited with her birth mother. But her desire to find her birth mother did not alienate her birth family, it only added members to her already loving family. Elizabeth, now 28 years old, was adopted by a family in Los Angeles. Kimberly, abandoned at birth in a Tustin Hospital, is now our adopted daughter and a beautiful 25 year old woman, attending college so she can become a psychologist to help others with the same life experiences she had. But the impact of the love of a mother doesn’t stop with helping orphaned children; there are consequences to their family members inspired by the actions of their mom. David, our oldest son, is a business man in Orange Count. Tim, our youngest son, is a pediatric cardiologist who spent ten days last Christmas with a medical team in Ethiopia and repaired the hearts of 38 children. Pat and I are now spending time working with the Local Orphan Care Initiative here at Saddleback Church to grow a coalition of churches and Orange County Social Services to find a loving home for every orphan in Orange County and to spread that model across the country. If it wasn’t for the love of Pat’s mother at the end of WWII, who fought for and adopted one brown-eyed baby girl, there wouldn’t be our marriage of 46 years, a business man making a difference for immigrant families, a cardiologist working on baby’s hearts, an adopted little girl studying to help others work through their emotional pain, and a senior couple now working on the Global Orphan Care Initiative at Saddleback Church. The love of a mother can change the world one life at a time. Together with God, you don’t need to start a revolution to make a difference; loving one lonely child at a time can change the world, just like Alma and Pat changed the lives of the orphaned children around them. 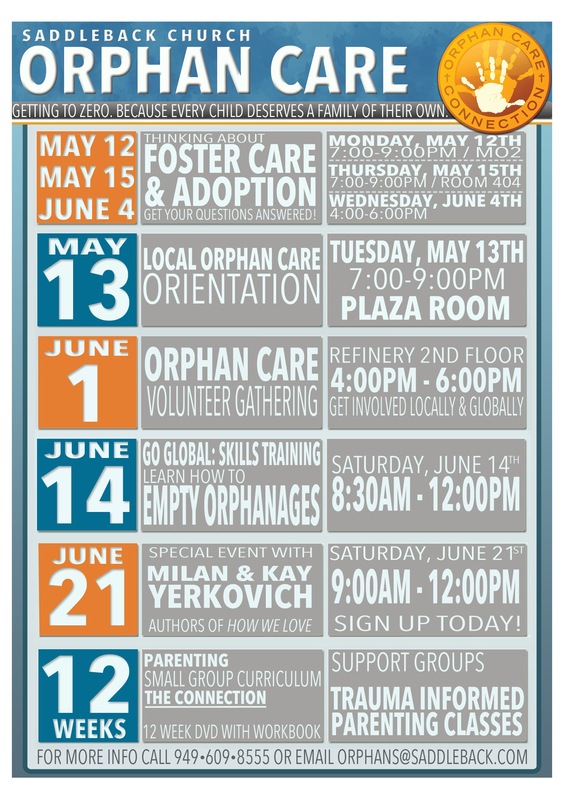 To get connected to Orphan Care at Saddleback, join us this Sunday from 4-6pm in the Refinery to hear the variety of opportunities available for you to make a difference in the life of an orphan! If you would like information on how your family can adopt or foster a child, join us at “Thinking About Adoption or Foster Care” Wednesday June 4th from 6:30-8:30pm, or call the Orphan Care Line at 949-609-8555.